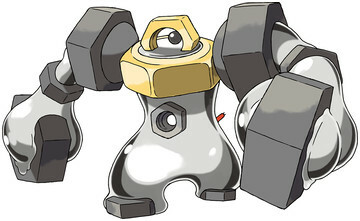 Melmetal is a Steel type Pokémon introduced in Generation 7. It is known as the Hex Nut Pokémon . Melmetal evolves from Meltan only in Pokémon GO, with 400 Meltan Candies. Candies can be obtained by catching many Meltan, have it travel as a Buddy Pokémon, or transferring some to Pokémon Let's Go. Melmetal has an exclusive move, Double Iron Bash. Note: Meltan has an ability assigned in the code for Pokémon Let's Go, even though abilities are not available. The effectiveness of each type on Melmetal. Pokédex entries are not yet known. Melmetal learns the following moves in Pokémon Let's Go Pikachu & Let's Go Eevee at the levels specified. Melmetal learns the following moves when it evolves in Pokémon Let's Go Pikachu & Let's Go Eevee (regardless of level). We don't have any Melmetal sprites yet. What is the fastest way to get Meltan to Evolve into Melmetal?